The PrivatPower PT10 provides 12 Volt wherever you are. It makes it ideal as a mobile phone or iPod charger, or to charge other small handheld equipment. Even trickle charging of your car battery is possible without an external regulator.The PrivatPower PT10 is equipped with a standard car cigarette lighter socket. You can charge your cell phone with any standard car charger via the cigarette lighter connector. For more power, eg. charging a laptop, several PT10 may be used, special connectors to build up a network are available on request. 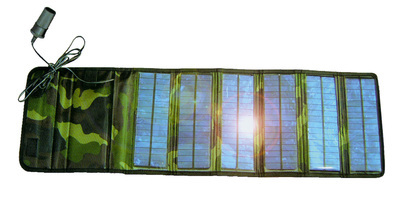 This solar power panel is not a toy compared to other products on the market, it is an efficient 10 watt energy source. Also available as 20 watt and 62 watt version. 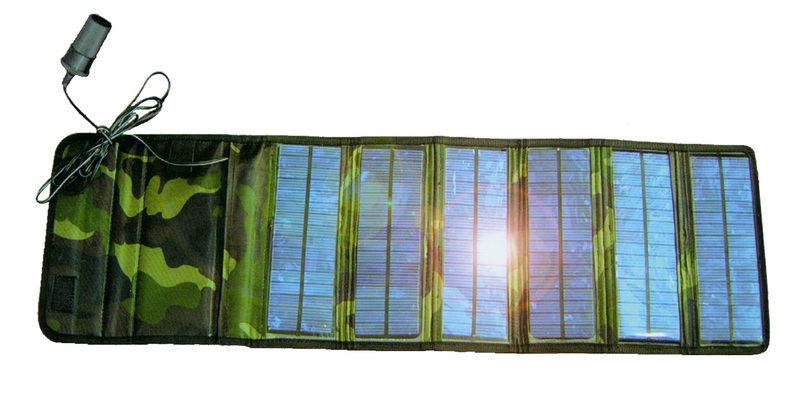 After unfolding, the solar module has to be exposed to direct sunlight. For maximum power the module has to be adjusted 90° to the sunrays. If the blue LED on the Module is flashing, the equipment may be connected. Shadow or dirt on the module will decrease power significant. Keep away from fire. Do not apply high forces, solarcells may break under heavy load. The module is water resistant, for maximum power do not submerge or soak it in water. Clean with water and soap, never use any sanding fluid or sharp tools.